Engineering, in all its glory. Trust yourself, you're an Engineer. 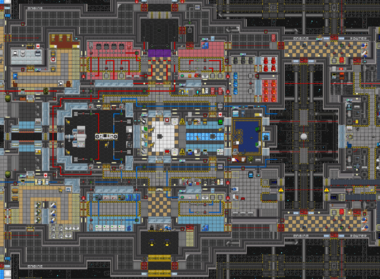 You start in Engineering with an epic array of gear, tools, and materials at your disposal and the equally epic responsibilities of starting the engine in Engineering and repairing and renovating the station. Both tasks may cause side effects such as horrific burns, rapid suffocation, and death. There are a plethora of ways to generate power, each with their own intricacies and subtleties, but as an Engineer, you're primarily concerned with the engine in Engineering. Depending on the map, that engine is either the Thermo-Electric Generator or the Geothermal Capture System. Get any gas flowing in the two gas loops that meet in the Thermo-Electric engine in the middle of Engineering. You want the top loop to be real hot and the bottom loop to be real cold. The temperature difference is what generates power. People usually focus on heating the hot loop. The hot loop can be heated by connecting hot gas to the loop in the first place, by burning fuel in the furnaces, or by getting a fire running in the combustion chamber. The cold loop mostly cools itself by a coil exposed to space. Be careful with pressure. Get it too high, and the pipes will burst. Don't forget to open valves as needed to get the gas going where it needs to go. You think that looks hard? Older stations used to be powered by a contained black hole. We're better off now than those weird Linemap people. The system generates power via geothermal vent units placed over the centers of hotspots, where it's hottest and thus produces the most power. You find these hotspots and locate their centers, you need place down (and pick up) dowsing rods and look at their readings. Redder/pinker colors indicate higher temperatures; lower numbers indicate closer distance to the center of a hotspot. As a hotspot drifts, it will drag any placed dowsing rods in its range along with it. Dowsing rods are also affected by Doppler shift, so there some places that say they're closer to the center than they actually are and some that say they're farther. Once you've located the center of a hotspot, lock it in place with a stomper unit. Then, dig a hole into it with a power shovel, build a vent capture unit on it, and wire it back to the station. To generate more power, you can move hotspots closer together so they generate more heat, dig out the rock in the hotspot's corresponding location in the trench to release the energy trapped underneath, or just build more holes and vent captures units around a vent capture spot. The more passive, easy-going companion to the engine, and the backup power supply if the engine breaks. Every map except Oshan Laboratory (for obvious reasons) has these. They're pretty much maintenance-free once the SMES units are set up or the solar panels are hotwired (i.e. the wires go from the solar panels straight to the station, rather than going through a SMES). However, if the wiring for the solars breaks for any reason, repairing it falls under your responsibility. Be sure to head over to the relevant page section to learn the correct SMES configurations and/or tips on hotwiring the solars. Once the engine is up and running, and the solar arrays are receiving starlight, the power generated by the engine then goes through wires connected to SMES units, which distribute a configured amount of power throughout the station to APCs, which control the machines, lights, and other immobile electrical devices in their designated rooms. Superconducting magnet arrays that use the principle of electromagnetic induction to store energy. Charging these to full isn't really a top priority, but the rest of the station receives power from these SMES units, so properly configuring them is important. The precise numbers are different for each station and engine setup, but a good configuration setting is little under half of the engine's output as SMES input (to counter fluctuations), and half of that as SMES output (to charge the SMES). With some fairly basic wiring knowledge, it is possible to bypass the SMES units altogether, a practice known as hotwiring. Hotwiring generally means the station is receiving more power at higher safety risk, which scales with the amount of power being generated. Hotwiring the solars arrays is almost always safe, with hotwiring the singularity or a basic low-power thermo-electric generator setup being slightly more dangerous. Hotwiring an advanced TEG setup that generates tens or hundreds of MW and more, however, is very likely to overload the station power network, potentially causing APCs to spontaneously shock people and electric shocks to seriously hurt, so you generally shouldn't do that unless you're an antagonist. Main breaker: Controls whether the room is getting power at all. Best not to mess with this, unless it actually is your job to mess with this. External power: Indicates if the room is receiving power and gives a qualitative description of how much. Good means it's receiving more than enough power, Low not enough, None no power at all. Power cell: Indicates the charge levels of the APC's backup internal cell. If the APC loses connection or receives inadequate amounts of power, it'll drain the cell until it runs out and all the electrical devices in the room lose power. Power Channels: Indicates how much power various categories of devices in the room are consuming and their power settings. On/Off are self-explanatory, Auto means the devices in the category will stay on if there is enough power is available and shut off to let other less power-hungry devices function if there is not. 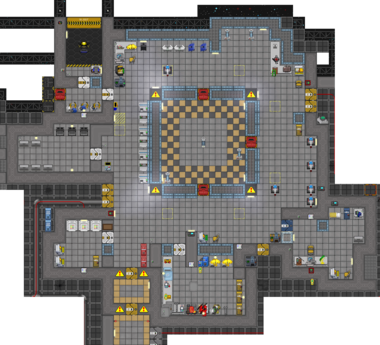 Equipment: Computers, manufacturers, vendors, dispensers, conveyor belts, things like that. Lighting: Light tubes and light bulbs, but not the emergency lights. Environmental: Fire alarms and firelocks, as well as emergency lighting. Total Load: The total power consumption of the electrical devices in area controlled by the APC. Cover lock: Indicates whether the APC's settings can be changed and whether the APC panel can be pried open with a crowbar or not. Swipe your ID on the APC to disengage the cover lock and make the Main Breaker and Power Channels settings configurable. If the solars and engine aren't generating and sending enough power, you'll be doing this a lot. In drastic/urgent cases (e.g. 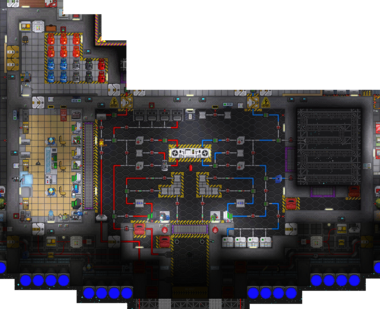 powering Medbay or Cloning after a power sink is removed), you might need to disengage the lock, pry open the APC panel, and insert a fresh fully-charged cell to repower a room. A treat for good Cogmap1, Cogmap2, Clarion, and Oshan Laboratory Engineers. Once you have the engine running, consider routing some of your extra watts into the power transmission laser. Not only does it output power as a frickin' laser beam, but said laser also puts money into the Payroll budget while it's powered! It takes some micromanagement, but if you can set it up right, you can make millions of credits every minute and earn the favor of the entire station, especially if you donate a share of the earnings to the Quartermaster's Cargo budget. Just keep a close eye on the input depriving any departments of power in the process. Luckily, you don't have to be glued to PTL controls or the Thermo-Electric Generator itself all round. All Engineer PDAs come with the program Power Checker 0.14, which gives you the same statistics as clicking on the PTL or TEG would, including vital statistics such as Power Output, Temperature Inlet, Pressure Inlet, Power Stored in PTL, etc. In this way, you can check in on the engine on the go as you go and actually fix things on the station. The Engineering department's other real job is repairing hull breaches and damage. To rep, you'll require a stack of metal. Though it's technically not required, you'll also want a space suit and an air tank-breath mask combo. All these can be found in Engineering Storage and, if your station/ship has one, Engineering Pod Bay. If there isn't a stack of floor tiles, click on a stack of metal while it's in your hand to bring up the construction window and select Floor Tiles. The precise number of tiles you'll need to make depends on the situation. Don't fret about making too little, as you can easily make more, or too many, as the extra tiles can potentially be reprocessed back into sheets, and sheets themselves are often plentiful and easy to make. To repair the breach, simply click on the space tile or lattice with the floor tiles in your active hand to create some flooring. Once totally sealed, garnish with space HVAC units so people can walk through the area without slowing to a crawl. If you want the area to look like it didn't totally just explode, you'll want to learn how to replace broken floor tiles. To do this, just use a crowbar on the tiles that look burned, and then replace them with new floor tiles. 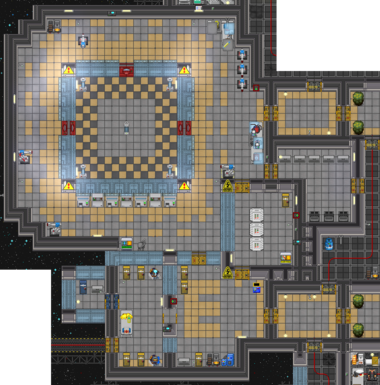 It's not really an important skill to have, but it does make the station look less like a death trap. You may also need to make walls to fully seal a breach. To do this, you'll require a stack of metal (and optionally rods). First, you need to build a girder, either by clicking on the stack to open the metal's construction window and selecting Wall Girders orby simply clicking on a tile with sheets in your active hand. Once the girder's built, use metal on it to form a wall. You can also use reinforced metal for the plating, which you can make by combining regular metal sheets and rods. If you want to make a false wall, use a crowbar on the girder first to dislodge it, then apply the plating. While you're at it, you should also repair any broken windows. It's easy. Similar to metal sheets, clicking on a stack of glass sheets in-hand opens up a construction window with the choices of large and thin windows. Most of the time, you'll be choosing large windows, simply because large windows are more common, but there are places that use thin windows. Windows with grilles are even easier. If the grille's still there (it doesn't matter how broken it is), you can just click on the grille while holding glass sheets of any kind to put a full-sized window over it. If the grille's gone, but there's still some bit of grille leftover, just click on a stack of rods while standing over the broken grille to repair it, then do the previously-mentioned steps. If the grille's completely gone, construct a new grille by clicking on a stack of at least two rods, then construct the windows are previously mentioned. Now, once you've fully sealed the breach, you might want to repressurize the room so that people aren't suffocating and gasping for air as they walk through the place. If the room has an Emergency Air Hookup for it, you can just connect the air canisters to the relevant ports and turn the relevant valves. If not, you'll have to manually refill the air by bringing in some air canisters. Don't just open it and leave it out in one spot; all the air will accumulate in that one spot rather than spreading out. Instead, set the canister to a fairly high (600 kPA or more) and move the canister every few seconds so the air is (hopefully) evenly distributed through the room. 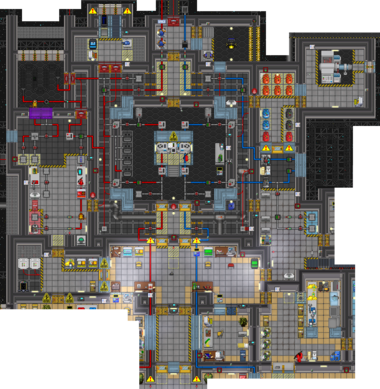 Scan the room tiles with an atmospheric analyzer every so often, and make sure there's at least 85 kPa of air mix (or at least 17 kPA of oxygen) on each tile. While you're at it, you should also replace the light tubes and bulbs. It's pretty straightforward. Just grab a few replacement light tube/bulb boxes from Engineering Storage (or make them using the fabricator in Tool Storage), take one of the tubes/bulbs out of the box, and click on the tube/bulb you want to replace. Plain light tubes and bulbs are fine, but if you want to, you can opt for colored lights and turn the room into some sort of swanky Christmas-themed nightclub/love-shack. If things get really bad, you might also need to replace the wiring. As always, Engineering Storage has plenty of wires, usually in either cable coil boxes or electrical toolboxes. Be sure to check out the Guide to Wiring for a primer on the fundamental principles of wiring. Don't fret too much about replicating the original layout. Just make sure there's a complete link with the rest of the power network. Once it's set up, one person can handle the engine safely, and most of the time, there are no hull breaches. So, it's time to get up to some mischief, since you've got nothing better to do. To start with the basics, Door Hacking. You'll need a multitool, a screwdriver, insulated gloves, and a crowbar. A wirecutter could also come in handy. Open the door's faceplate with the screwdriver, then click with an empty hand. A window will come up. Minimize it and take out your multitool. The window will show a bunch of wires with buttons for Cut, Pulse, and Attach Signaller on them. Start from the top, and begin pulsing wires. Pulse each one once. There are notifications at the bottom for Power, Bolts, and AI control. If you trigger a Power wire, you can use the crowbar on the door to open it. Power will be down for 10 seconds, and then backup power will trigger. Pulsing the backup power wire will disable it for 1 minute. If the bolts go down, then the door can't be opened. Pulse the same wire again to undo the bolts. The Bolts can go down at all times, but can only disengage if the power wires are operating. If you accidentally hit the bolts when the power is down, you might have to wait a minute to continue. It's also a good point that an engineer who is well versed in how hacking doors work, when provided the tools to do so have effectively all access to any portion of the station they wish. Nothing is better at stopping a corrupted AI than an insulated glove wearing Engineer who knows his stuff. Another bad idea for Engineers is making and wearing Stungloves. To make a pair of Stungloves, take a pair of insulated gloves and use wiring on them. Then use the Insulated Gloves on a power cell to charge them. If you wear them and hit someone with the harm intent, you'll shock them. This sounds great (and it is), but stun gloves have an extremely obvious sprite and sometimes Security Officers will deem them as a weapon and arrest you to get them. If you do make some Stungloves, keep them in your backpack until things start blowing up. After there's been a few murder reports, even the most fascist Security Officers will be too busy to care about your gloves. Traitor Engineers often choose to wreak a little havoc using the AI as an assistant. With easy access to tools and gloves, you can easily break in to the AI Upload and give it a law that'll send it on a bloody rampage. You'll have to careful around the stun turrets (which you can't turn off), but they're easy to dodge if you're fast enough. (If you're not, throw a foam grenade into the upload to block them off.) To seal the deal, take the Reset module and AI Upload circuit board in the Computer Core and deconstruct the Robotics Control Computer, so the crew can't reset or killswitch the AI. The power transmission laser can also reach insane levels of power if enough watts are being sent out, to the point that contact causes immediate, absolute disintegration. The flow of the laser is fixed, so you can only take advantage of it in particular places, but it makes for excellent corpse removal and a nice way of executing any stunned or unconscious victims. With some good engineering knowledge and hotwiring skills, a traitor engineer can hotwire the engine directly to the power grid (exactly where will vary from map to map) and weaponize the engine itself. Hotwiring an sufficiently powerful (25 MW or more is a good start) thermo-electric generator setup will overload the station's power network, causing APCs all across the station to spontaneously shock people, stunning them and inflicting burn damage. The greater the power output, the nastier the shocks. This is great way to wreak havoc and sow chaos across the whole station. Just be careful not to get shocked yourself; the APC shocks will bypass your insulated gloves. Even better, hotwiring also increases the burn damage of electrified doors. If you hotwire a sufficiently high power engine (~55-60 MW), electrified doors will to outright gib people who aren't sufficiently protected. 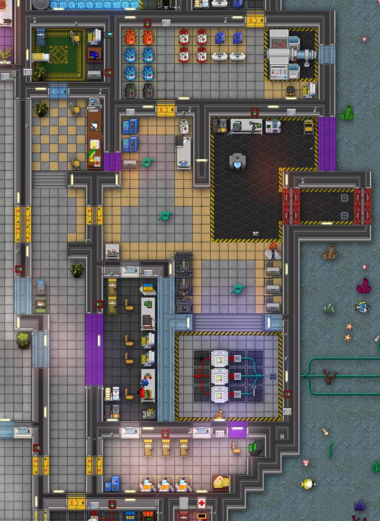 With some good knowledge of door wiring or a subverted AI, you can kill people simply by having them open the wrong door, while the APCs all over the station rain down nasty electric shocks on everyone. Engineers also make great bombers. 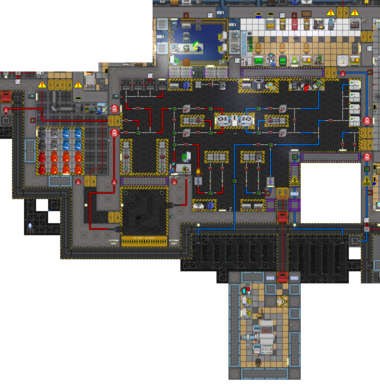 Engineering comes with all the welding fluid, metal sheets, and wire you need for to rain pipe bombs upon the station, plus plenty of extra items for unique and deadly effects. Plasma from the hot loop is great for making bomb mixes, especially if you have a good burn going in the combustion chamber. You can siphon it off for your TTVs and single tank bombs simply by wrenching an empty canister (or air pump with plasma tank) onto any of the hot loop ports.